Meet the SYSTEM-1, a synthesizer that's probably unlike any you've encountered before. At its heart is Roland's new Analog Circuit Behavior (ACB) technology, which they've used to carefully analyze every aspect of analog circuits and then faithfully recreate them down to the finest details. This technology fills the SYSTEM-1, creating a fusion of beautifully classic and utterly modern synthesizer tones. The SYSTEM-1 not only sounds amazing, but also has a totally innovative design with performance-ready controls, quality construction, and a dizzying array of lights and knobs and sliders that proclaim unashamedly: "I am synthesizer. Hear me roar." Sound good? There's more. . . 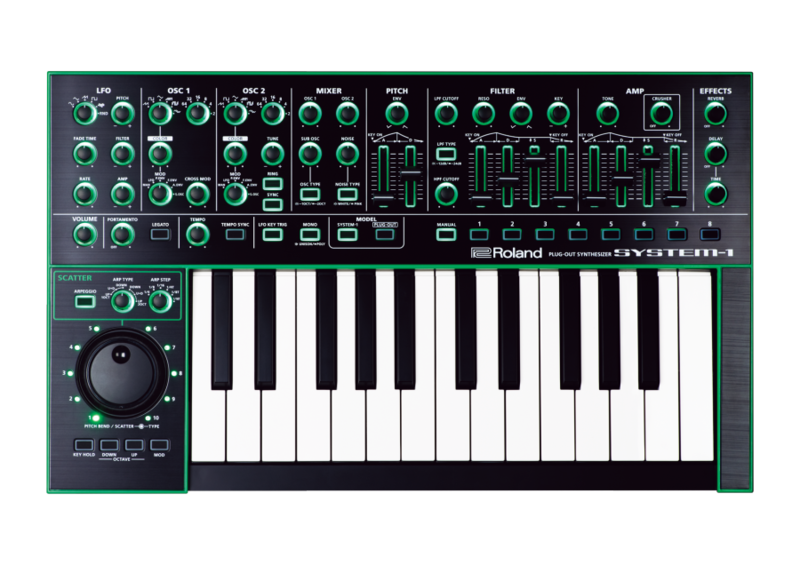 The SYSTEM-1 can control - and even host - software recreations of classic Roland synthesizers. That's right - the SYSTEM-1 gives you access to plug-in versions of legendary Roland synths, and they can be hosted in the SYSTEM-1 itself, with no computer required. You can even switch between the SYSTEM-1's internal sounds and those of the hosted plug-in. Roland calls this wizardry PLUG-OUT, and were pretty excited about it. We think you'll be excited too once you experience the supreme authenticity of the upcoming SH-101 soft synth, with the SYSTEM-1 providing an intuitive and fully automatic one-to-one control interface that just works. Lets be honest: who could make a better plug-in version of a classic Roland synth than Roland? And the SH-101 is just the beginning - more PLUG-OUT synths are on the way. I was not impressed at all with this toy. I was expecting better from Roland! The keyboard is cheap. Not even pressure sensitive. the keys are loud and clack as well. Plastic finish, makes it feel like its not quality. The sound is hit and miss. I could not get the plug-out system to work at all. Could be me not understanding the instructions or online how to videos, but it just wouldnt Best decision I made was to return it to get a real analog synth. the ONLY feature I liked was the arpeggiator. But even then, it was more like a toy that was fun to play with and had no value for music production. Less that most analog synths in cost. 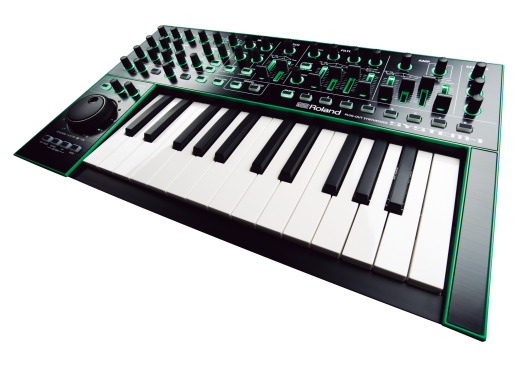 Use MIDI with another KB for better control on the pitch wheel, play larger range of notes or to make keys velocity sensitive. Knob range can push sounds to unrecognizable (i.e. pitch envelope on Sine wave becomes a TR-909 kick!). "Colour" knob takes waveforms from plain hearing test chimes to full sounding Rave pads. Even classic midi KB sounds can be discovered like Harp or Brass through manipulation. Detuning waveforms, adding Sync or Ring (mathematical function applied to both waves) makes great haunting or clear sounds decent for Trap music or Industrial sounds in cinema. "Limitless"
Internal synth is sick. They added new waveforms in the last firmware. The plugouts are insane (but $$). Very easy to program a patch in vst, then upload it directly in the synth.